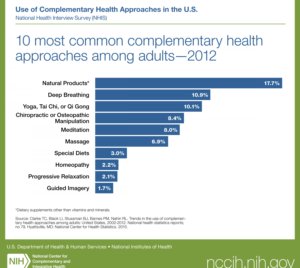 I find it especially interesting that people who use a variety of complementary health approaches reported better health and well-being. 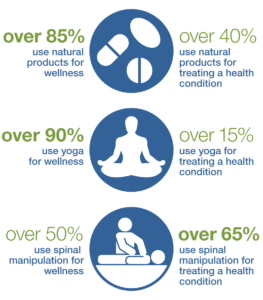 To me, this may suggest that people perceive more benefit of wellness when they are actively engaged in their health, for example by taking a yoga class. 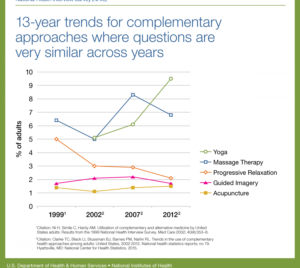 The role of complementary health approaches in promoting positive health behaviors is an exciting area of investigation, particularly when so many are faced with chronic conditions impacted by lifestyle. The good news, too, is that mind and body practices, such as yoga, are generally considered to be safe in healthy people when practiced appropriately. Yet, yield caution with dietary supplements. Interactions may occur between prescription drugs, over-the-counter drugs, dietary supplements, and even small molecules in food—making it a daunting challenge for scientists to identify all interactions that could be harmful. The bottom line here is that there’s a lot we don’t know and much more study needed. However, attention must be paid to a few herbs such as St. John’s wort and goldenseal, and a few others, which have a high risk of potential interactions with certain drugs. A new module to help understand these types of interactions is now available on our Web site. In addition, we’ve just announced an award to the University of Washington for a new Center of Excellence, whose goal is to provide leadership on how best to study potential adverse interactions between natural products and conventional medications.